Pass, normal V60 looks MUCH better. Agreed, the XC is nice, but I'd have a V60 T6 instead. With the sun finally shining — it rises late and retires early this far north — it was time to torture the latest Volvo V60 wagon. In this case, it’s the T8 Twin-Engine R-Design. This version adds a bold body kit, which makes it look meaner, and slides an advanced plug-in hybrid system under the hood. As a package it is one to relish! You've got to appreciate Volvo's steadfast and irrational commitment to America's consistently dismal wagon market. 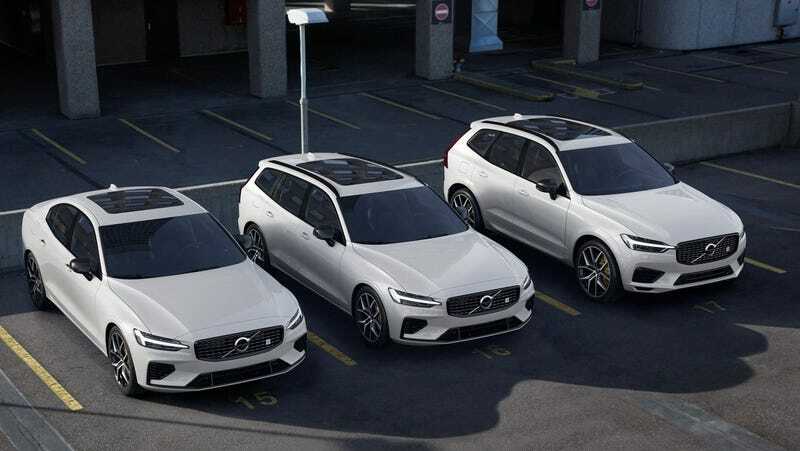 While other automakers have been doing the hokeypokey when it comes to the body style, the 2019 V60 is Volvo's third new wagon in the past 18 months. It's an example of sticking with what got you here. Longroofs were the brand's signature product from 1962 until the launch of its first SUV, the XC90, for the 2003 model year. Wagons are to Volvo what rear-engine sports cars are to Porsche. Broad shouldered with sharp speed lines and longitudinal-engine proportions, the V60 is another affirmation of Volvo's current design language. But the engine actually rides parallel to the front axle on the brand's Scalable Product Architecture, which the V60 shares with the S60 sedan and the larger V90 wagon as well as Volvo's popular XC60 and XC90 SUVs. Although it comfortably outsizes the less expensive XC40 in length, at 3798 pounds, the V60 weighs about the same as the compact crossover. Like its platform-mates, the V60 feels strong and solid on the road. Its steering is hefty and the wagon is locked in at speed. The front-wheel-drive V60 T5, tested here, also changes direction willingly, understeering moderately on its 18-inch Contis with little body roll. On the skidpad, it generates 0.87 g. Its chassis uses a multilink rear suspension with a single transverse leaf spring and is tuned on the firm side of compliant, but the ride is supple compared with that of the T6 model, which can be had with adaptive dampers and 19-inch Pirellis. Response from its brake pedal is also firm and reassuring, though the 177-foot stop from 70 mph is long compared with the V60's peers'. Starting at a base price of $39,895, T5 models get a turbocharged 2.0-liter inline-four mated to an eight-speed automatic. 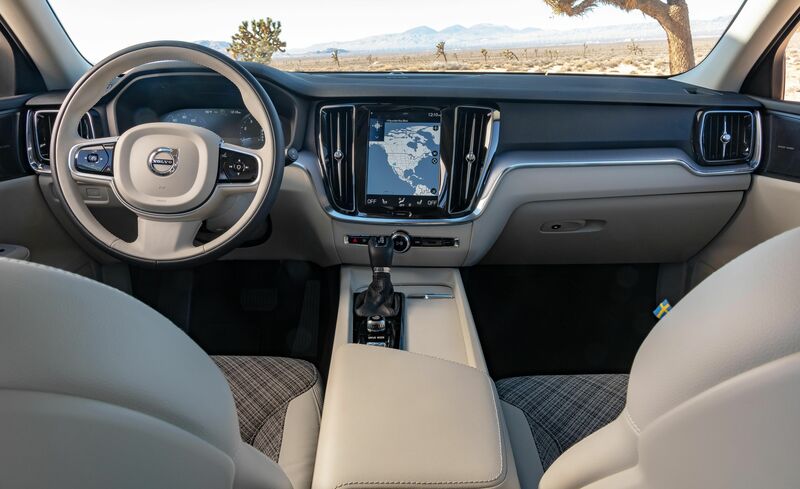 We've praised the powertrain's performance in other Volvos, and its 250 horsepower and 258 pound-feet of torque move the wagon with verve. At the test track, the V60 T5 accelerated to 60 mph in 6.4 seconds and through the quarter-mile in 14.9 seconds, but it feels even quicker in the real world. Torque peaks at 1500 rpm, and the eight-speed is rarely in the wrong gear—which is good, because there are no paddle shifters. If you were bummed you missed out on snagging one of the 2019 Volvo S60 Polestar Engineeredmodels last year, which sold out in under an hourbecause only 20 were offered in the U.S., then you’re in luck. Volvo has worked the same Polestar engineering into the 2020 Volvo XC60and 2020 Volvo V60, so now’s your chance. How much? We need more performance wagons in our lives. Oh absolutely. The question should have been how much for a used one? Or if they'll go on the 'normal' used market, if they follow the same subscription-only sales. I imagine it'll be cheaper than an AMG E-Estate, but likely had a fair bit less performance behind it as well.